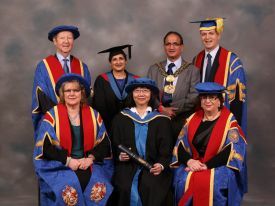 Eur Ing Dr Phebe Mann, a CULS member, has received an Honorary Fellowship from Bradford College in recognition of her contribution to civil engineering and construction law and her efforts to encourage more women enter the sector. Phebe was described by the College as a ‘potent role model for women in science and engineering’. Throughout a groundbreaking career, she has won numerous awards and accolades for her contributions including the 2011 Woman of Outstanding Achievement ‘Tomorrow’s Leader’ award from WISE*. She is a Fellow of Higher Educational Academy (FHEA). In recognition of her innovation and research work, Phebe has also won an Innovation and Research Award from the Chartered Institute of Building. More recently, the Society of Construction Law commended her submission for the Hudson Prize and the Australian Brooking Prize. Phebe is the first and only woman in the UK to hold five professional engineering qualifications concurrently – Chartered Civil Engineer (CEng MICE), Chartered Surveyor (MRICS), Chartered Builder (MCIOB), Member of the Chartered Institute of Arbitrators (MCIArb), and European Engineer (Eur Ing). In recognition of her contributions, she was nominated a Fellow of the Royal Society of Arts (FRSA). She has led the way for other women to consider, and be considered for, senior roles in the engineering industry. Acting as an Ambassador for STEM and a Talent2030 Hero, she is determined to encourage young women to pursue civil engineering careers and forge their own paths in the sector. Accepting the Honorary Fellowship, Phebe said: “I am deeply humbled and greatly honoured to be conferred an Honorary Fellowship acknowledging my eminence in construction law, engineering, and education and my support of other women in Science, Technology, Engineering and Maths (STEM) industries. I am passionate about my career in construction; and delighted to see more and more young people, especially women, contemplate careers in the industry. Phebe is a civil engineering senior lecturer in highway and transportation, construction and planning law at the University of East London. In September, she hosted the London’s Engineering Heritage Institution of Civil Engineers Boat Tours of the Open House London 2013, to showcase the vital role of civil engineers in building, maintaining and transforming the capital’s infrastructure and built environment. Phebe is very grateful to Sir Vivian Ramsey, a Technology and Construction Court judge with a background as a civil engineer, for his valuable advice and encouragement. She would like to contribute to commercial and construction law with her knowledge and experience in technology and construction.